The bone marrow—the sponge-like tissue found in the center of certain bones—contains stem cells that are the precursors of white blood cells, red blood cells, and platelets. These blood cells are vital for normal body functions, such as oxygen transport, defense against infection and disease, and clotting. Blood cells have a limited life span and are constantly being replaced; therefore, the production of healthy stem cells is vital. In association with certain diseases, stem cells may produce too many, too few, or abnormal blood cells. Also, medical treatments may destroy stem cells or alter blood cell production. Blood cell abnormalities can be life-threatening. Bone marrow transplantation involves extracting bone marrow containing normal stem cells or peripheral stem cells from a healthy donor, and transferring it to a recipient whose body cannot manufacture proper quantities of normal blood cells. The goal of the transplant is to rebuild the recipient's blood cells and immune system and hopefully cure the underlying disease. A person's red blood cells, white blood cells, and platelets may be destroyed or may be abnormal due to disease. Also, certain medical therapies, particularly chemotherapy or radiation therapy, may destroy a person's stem cells. The consequence to a person's health is severe. Under normal circumstances, red blood cells carry oxygen throughout the body and remove carbon dioxide from the body's tissues. White blood cells form the cornerstone of the body's immune system and defend it against infection. Platelets limit bleeding by enabling the blood to clot if a blood vessel is damaged. Cancerous diseases may or may not specifically involve blood cells; but, cancer treatment can destroy the body's ability to manufacture new blood cells. Bone marrow transplantation may be used in conjunction with additional treatments, such as chemotherapy, for various types of leukemia, Hodgkin's disease, lymphoma, breast and ovarian cancer, renal cell carcinoma, myelodysplasia, myelofibrosis, germ cell cancer, and other cancers. Noncancerous diseases for which bone marrow transplantation can be a treatment option include aplastic anemia, sickle cell disease, thalassemia, and severe immunodeficiency. The decision to prescribe a bone marrow transplant is based on the patient's age, general physical condition, diagnosis and stage of the disease. A person's age or state of health may prohibit use of a bone marrow transplant. The typical cut-off age for a transplant ranges from 40 to 55 years; however, a person's general health is usually the more important factor. Before undergoing a bone marrow transplant, the bone marrow transplant team will ensure that the patient understands the potential benefits and risks of the procedure. The first successful bone marrow transplant took place in 1968 at the University of Minnesota. The recipient was a child with severe combined immunodeficiency disease and the donor was a sibling. In 1973, the first unrelated bone marrow transplant was performed at Memorial Sloan-Kettering Cancer Center in New York City on a five-year-old patient with severe combined immunodeficiency disease. In 1984, Congress passed the National Organ Transplant Act which included language to evaluate unrelated marrow transplantation and determine if a national donor registry was feasible. The National Bone Marrow Donor Registry (NBMDR), now called the National Marrow Donor Program (NMDP), was established in 1986. The NMDP Network has more than four million volunteer donors and has Donor Centers and Transplant Centers in 14 countries. About 40% of the transplants facilitated by the NMDP involve either a U.S. patient receiving bone marrow and/or stem cells from an international donor, or an international patient receiving bone marrow/stem cells from a U.S. donor. The NMDP coordinates more than 130 stem cell transplants each month. Approximately 12,000 total bone marrow/stem cell transplants have been performed since the organization was founded. AUTOLOGOUS AND ALLOGENEIC TRANSPLANTS. Two important requirements for a bone marrow transplant are the donor and the recipient. Sometimes, the donor and the recipient may be the same person. This type of transplant is called an autologous transplant. It is typically used in cases in which a person's bone marrow is generally healthy but will be destroyed due to medical treatment for diseases such as breast cancer and Hodgkin's disease. Autologous transplants are also possible if the disease affecting the bone marrow is in remission. If a person's bone marrow is unsuitable for an autologous transplant, the bone marrow must be derived from another person in an allogeneic transplant. An allogeneic bone marrow donor may be a family member or an unrelated donor. The donated bone marrow/peripheral stem cells must perfectly match the patient's bone marrow. The matching process is called HLA (human leukocyte antigens). Antigens are markers in cells that stimulate antibody production. HLA antigens are proteins on the surface of bone marrow cells. HLA testing is a series of blood tests that evaluate the closeness of tissue between the donor and recipient. If the donor and the recipient have very dissimilar antigens, the recipient's immune system regards the donor's bone marrow cells as invaders and launches a destructive attack against them. Such an attack negates any benefits offered by the transplant. NON-MYEOBLATIVE ("MINI") ALLOGENEIC TRANSPLANTS. A "mini" transplant involves receiving lowdoses of chemotherapy and radiation therapy, followed by the infusion of a donor's bone marrow or peripheral stem cells. The goal is to suppress the patient's own bone marrow with low-dose chemotherapy and radiation therapy to allow the donor's cells to engraft. If there are cancer cells remaining in the patient's body, the donated cells are able to identify the cancer cells as foreign and trigger an immune response, killing the cancer cells. This is called the graft-versus-tumor effect. Mini transplants are still under investigation but are promising for the future. PERIPHERAL BLOOD STEM CELL TRANSPLANTS. A relatively recent development in stem cell transplantation is the use of peripheral blood stem cells instead of cells from the bone marrow. Peripheral blood stem cells (PBSCs) are obtained from circulating blood rather than from bone marrow, but the amount of stem cells found in the peripheral blood is much smaller than the amount of stem cells found in the bone marrow. Peripheral blood stem cells can be used in either autologous or allogeneic transplants. The majority of PBSC transplants are autologous. However, clinical studies indicate that PBSCs are being used more frequently than bone marrow for allogeneic bone marrow transplantation. The advantages of PBSC transplants when compared to bone marrow transplants are: in allogeneic transplantation, haematopoietic and immune recovery are faster with PBSCs. In autologous transplantation, the use of PBSCs can result in faster blood count recovery. Also, some medical conditions exist in which the recipient cannot accept bone marrow transplants, but can accept PBSC transplants. Some possible disadvantages to PBSC transplant versus bone marrow transplantation are: so much more fluid volume is necessary to collect enough PBSCs that, at the time that the new stem cells are infused into the recipient, the fluid can collect in the lungs. Also, the time commitment for the donor for a PBSC transplant is considerable. When the PBSCs are being collected, several outpatient sessions are needed and each session lasts approximately two to four hours. UMBILICAL CORD BLOOD TRANSPLANT. Umbilical cord blood transplant is a relatively new procedure in which umbilical cord blood from a newborn is used as the donor source. Umbilical cord blood is rich in stem cells, the cells that are needed for transplantation, and these cells are theoretically "immunologically naïve," reducing chances of rejection and making it a good source for donation. The matching criteria is the same as for bone marrow. Most programs to date use this procedure for a sibling or store cord blood for anonymous donation. Umbilical cord blood can be an excellent source for children. One potential problem with umbilical cord blood transplantation is the low volume of stem cells contained in the umbilical cord. In many instances, there is inadequate volume to safely use for a transplant in an adult recipient. HLA MATCHING. There are only five major HLA classes or types—designated HLA-A, -B, -C, -D, and class III—but much variation within the groupings. For example, HLA-A from one individual may be similar to, but not the same as, HLA-A in another individual; such a situation can render a transplant from one to the other impossible. BONE MARROW TRANSPLANTATION. The bone marrow extraction, or harvest, is the same for autologous and allogeneic transplants. Harvesting is done under general anesthesia (i.e., the donor sleeps through the procedure), and discomfort is usually minimal afterwards. Bone marrow is drawn from the iliac crest (the part of the hip bone to either side of the lower back) with a special needle and a syringe. Several punctures are usually necessary to collect the needed amount of bone marrow, approximately 1–2 quarts. (This amount is only a small percentage of the total bone marrow and is typically replaced within four weeks.) The donor remains at the hospital for 24–48 hours and can resume normal activities within a few days. If the bone marrow is meant for an autologous transplant, it is stored at -112–-320°F (-80–-196°C) until it is needed. If a patient's own bone marrow can be used for transplantation or if a donor is not found, peripheral stem cells may be harvested from the patient's circulating blood. Bone marrow for an allogeneic transplant is sometimes treated to remove the donor's T cells (a type of white blood cell) or to remove ABO (blood type) antigens; otherwise, it is transplanted without modification. The bone marrow or peripheral stem cells are administered to the recipient via a catheter (a narrow, flexible tube) inserted into a large vein in the chest. The donor cells look like a bag of blood and are infused for about 20–30 minutes. During the infusion, the patient's blood pressure, pulse, and breathing are monitored. From the bloodstream, it migrates to the cavities within the bones where bone marrow is normally stored. If the transplant is successful, the bone marrow begins to produce normal blood cells once it is in place, or engrafted. PERIPHERAL BLOOD STEM CELL TRANSPLANTATION. Before collection for a PBSC transplant, donors receive four injections daily of the drug G-CSF, or filgrastim. (Patients can give it to themselves at home if necessary.) These pretreatments stimulate the body to release stem cells into the blood. After these pretreatments, the donors' experience is similar to that of a whole blood donor's experience—PBSC donors' blood is collected at a clinic or hospital as an outpatient procedure. The differences are that several sessions will be needed over days or weeks and the blood is collected in a process called apheresis. The blood travels from one arm into a blood cell separator that removes only the stem cells, and the rest of the blood is returned back to the donor, in the other arm. The cells are then frozen for later use. Bone marrow transplantation is an expensive procedure. (Bone marrow donors are volunteers and do not pay for any part of the procedure.) Insurance companies and health maintenance organizations (HMOs) may not cover the costs. Many insurance companies require pre-certification letters of medical necessity. As soon as bone marrow transplantation is discussed as a treatment option, it is important for the patient to contact his or her insurance provider to determine what costs will be covered. In addition, a complete dental exam is needed before the bone marrow transplant to reduce the risk of infection. Other precautions will be taken before the transplant to reduce the patient's risk of infection. A triple lumen, central venous catheter (a slender, hollow flexible tube) is surgically inserted into a large vein in the chest during a simple outpatient procedure. The catheter is used to draw blood and infuse chemotherapy and other medications as well as donor cells, blood product, fluids, and sometimes nutritional solutions. The central venous catheter usually stays in place for about six months after the bone marrow transplant. Hormone-like medications called colony stimulating factors may be given before the transplant to stimulate the patient's white blood cells. These medications stimulate the white blood cells to multiply, mature, and function. These medications also help the patient's white blood cells recover from chemotherapy and reduce the risk of infection. A bone marrow transplant recipient can expect to spend three to four weeks in the hospital, depending on the rate of recovery. In preparation for receiving the transplant, the recipient undergoes "conditioning"—a preparative regimen (also called marrow ablation) in which the bone marrow and abnormal cells are destroyed. Conditioning rids the body of diseased cells and makes room for the marrow or peripheral stem cells to be transplanted. It typically involves chemotherapy and/or radiation treatment, depending on the disease being treated. Unfortunately, this treatment also destroys healthy cells and has many side effects such as extreme weakness, nausea, vomiting, and diarrhea. These side effects may continue for several weeks. A two- to four-week waiting period follows the marrow transplant before its success can begin to be judged. The marrow recipient is kept in isolation during this time to minimize potential infections. The recipient also receives intravenous antibiotic, antiviral, and antifungal medications, as well as blood and platelet transfusions to help fight off infection and prevent excessive bleeding. Blood tests are performed daily to monitor the patient's kidney and liver function, as well as nutritional status. Other tests are performed as necessary. Further side effects, such as nausea and vomiting, can be treated with other medications. Once blood counts are normal and the side effects of the transplant abate, the recipient is taken off antibiotics and usually no longer needs blood and platelet transfusions. Following discharge from the hospital , the recipient is monitored through home visits by nurses or outpatient visits for up to a year. For the first several months out of the hospital, the recipient needs to be careful in avoiding potential infections. For example, contact with other people who may be ill should be avoided or kept to a minimum. Further blood transfusions and medications may be necessary, but barring complications, the recipient can return to normal activities about six to eight months after the transplant. The procedure has a lower success rate the greater the recipient's age. Complications are exacerbated for people whose health is already seriously impaired, as in late-stage cancers. Bone marrow transplants are accompanied by serious and life-threatening risks. Furthermore, they are not always an absolute assurance of a cure for the underlying ailment; a disease may recur in the future. In the short term, there is the danger of pneumonia or other infectious disease, excessive bleeding, or liver disorder caused by blocked blood vessels. The transplant may be rejected by the recipient's immune system, or the donor bone marrow may launch an immune-mediated attack against the recipient's tissues. This complication is called acute graft-versus-host disease, and it can be a life-threatening condition. Characteristic signs of the disease include fever, rash, diarrhea, liver problems, and a compromised immune system. Approximately 25–50% of bone marrow transplant recipients develop long-term complications. Chronic graft-versus-host disease symptoms include skin changes such as dryness, altered pigmentation, and thickening; abnormal liver function tests ; dry mouth and eyes; infections; and weight loss. Other long-term complications include cataracts (due to radiation treatment), abnormal lung function, hormonal abnormalities resulting in reduced growth or hypothyroidism, secondary cancers, and infertility. Approximately 30% of people receiving allogeneic transplants do not survive. Autologous transplants have a much better survival rate—nearly 90%—but are not appropriate for all types of ailments requiring a bone marrow transplant. Furthermore, autologous transplants have a higher failure rate with certain diseases, specifically leukemia. At two years, the survival rate for patients with chronic myelogenous leukemia is 52% if they received a transplant in a chronic phase of their disease, 30% for patients in an accelerated phase and 15% for patients in the blast phase. Complementary therapies are used along with standard cancer treatments. These treatments are aimed at bringing about some overall improvement in general health and well being. Complementary therapies can be helpful in managing symptoms and improving quality of life. They can be used to help alleviate pain; reduce nausea; strengthen muscles; and to decrease depression, anxiety, and stress. It is important to distinguish between alternative therapies (unproven methods promoted for use instead of mainstream treatment) and complementary therapies, which are used with standard treatment. Complementary therapies are noninvasive and soothing. However, before trying them, patients should check with their oncologist to make sure the complementary therapy will not interfere with standard cancer therapy or cause harm. Examples of complementary therapies are massage therapy, aromatherapy, meditation, yoga, biofeedback, music, art and dance therapies, group and individual therapy or counseling. Hormone therapy is the treatment of cancer by removing, blocking, or adding hormones. Hormones are chemical substances produced by glands in the body that enter the bloodstream and cause effects in other tissues. Hormone therapies may be used to treat breast and prostate cancers. Hormone therapy may also be used in some situations for other cancers. Immunotherapy, also called biological therapy, is a type of treatment that uses the body's immune system to fight cancer. The therapy mainly consists of stimulating the immune system with highly purified proteins that help it do its job more effectively. Radiation therapy is the use of high-energy x rays, electron beams, or radioactive isotopes to attack cancer. Radiation therapy causes cancer cell death by ionization or by damaging the chromosomes in the cancer cells so they cannot multiply. Radiation therapy is a local treatment aimed directly at the cancer. Even though the radiation is aimed only at the cancer, it must often pass through skin and other organs to reach the tumor. Thus, some healthy cells may become damaged, too. The body however is able to repair the healthy cells that have been damaged and restore them to their proper function. Aside from its use as a single treatment, radiation therapy has been shown to enhance the effects of chemotherapy. It can be used in combination with chemotherapy to shrink a tumor. Successful radiation therapy depends on delivering the proper amount of radiation to the cancer in the best, and most effective way. Dreger, P., and N. Schmitz. "Allogeneic Transplantation of Blood Stem Cells: Coming of Age?" Annals of Hematology 80, no. 3 (March 2001): 127–36. Nuzhat, Iqbal, Donna Salzman, Audrey J. Lazenby, et al. "Diagnosis of Gastrointestinal Graft-Versus-Host Disease." The American Journal of Gastroenterology 95 (November 2000): 3034–3038. American Cancer Society. 1599 Clifton Road, NE, Atlanta, GA 30329. (800) 227-2345, (404) 320-3333. http://www.cancer.org . American Society for Blood and Marrow Transplantation (ASBMT). 85 W. Algonquin Road, Suite 550 Arlington Heights, IL 60005. (847) 427-0224. mail@asbmt.org. BMT Infonet (Blood and Marrow Transplant Information Network). 2900 Skokie Valley Road, Suite B, Highland Park, IL 60035. (847) 433-3313, (888) 597-7674. help@bmtinfo net.org. http://www.bmtinfonet.org . Bone Marrow Transplant Branch, U.S. Department of Health and Human Services. http://www.hrsa.gov/osp/dot/bone.htm . Bone Marrow Transplant Newsletter. 1985 Spruce Ave., Highland Park, IL, 60035. (847) 831-1913. http://www.bmtnews.org . Cancercare. (800) 813-HOPE (4673). http://www.cancercare.org . Health Resources and Services Administration. 5600 Fishers Lane, Rm. 14-45, Rockville, MD 20857. (301) 443-3376. comments@hrsa.gov. http://www.hrsa.gov . International Bone Marrow Transplant Registry/Autologous Blood and Marrow Transplant Registry N. America. Health Policy Institute, Medical College of Wisconsin, 8701 Watertown Plank Road, P.O. Box 26509, Milwaukee, WI 53226. (414) 456-8325. ibmtr@mcw.edu. Leukemia & Lymphoma Society, Inc. 1311 Mamaroneck Avenue White Plains, NY 10605. (914) 949-5213. http://www.leukemia-lymphoma.org . Lymphoma Research Foundation of America. 8800 Venice Boulevard, Suite 207, Los Angeles, CA 90034. (800) 500-9976. (310) 204-7040. helpline@lymphoma.org. http://www.lymphoma.org . National Bone Marrow Transplant Link. 20411 W. 12 Mile Road, Suite 108, Southfield, MI 48076. (800) LINK-BMT (800-546-5268). http://comnet.org/nbmtlink/home2.html . National Foundation for Transplants. 1102 Brookfield, Suite 200, Memphis, TN, 38110. (800) 489-3863 or (901) 684-1697. http://www.transplants.org . National Marrow Donor Program. Suite 500, 3001 Broadway Street Northeast, Minneapolis, MN 55413-1753. (800) MARROW-2. http://www.marrow.org . National Organ and Tissue Donation Initiative. http://www.organdonor.gov . Transplant physicians specially trained in bone marrow transplantation should perform this procedure. Bone marrow transplant physicians have extensive experience in hematology/oncology and bone marrow transplant. Selecting a transplant center that has a multi-disciplinary team of specialists is important. The bone marrow transplant team should include transplant physicians, infectious disease specialists, pharmacologists, registered nurses and transplant coordinators. Other transplant team members may include registered dietitians, social workers, and financial counselors. When selecting a transplant center, the patient should find out where the center is accredited. Some examples of accrediting organizations include The Foundation for the Accreditation of Cellular Therapy, the American Association of Blood Banking, the National Marrow Donor Program, and other state-level accreditation organizations. How many bone marrow transplants are performed annually and what are the outcomes/survival rates of those transplants? Does the transplant center perform transplants for the patient's type of disease? How many has it performed to date? Does the transplant center have experience treating patients the same age as the patient considering transplant? What is the required patient and unrelated donor HLA matching level at this center? How much does a typical bone marrow transplant cost at this facility? If the transplant center is far from the patient's home, will accommodations be provided for caregivers? What type of transplant is recommended for my condition? What are the potential benefits of bone marrow transplantation? Where does transplanted bone marrow come from? What types of tests are required to screen me for the bone marrow transplant? What types of tests are used to screen potential bone marrow or peripheral stem donors? Are bone marrow or peripheral stem cell donors compensated? After my bone marrow transplant, can I contact an unrelated donor? How can I do this? Will my insurance provider cover the expenses of my bone marrow transplant? What types of questions should I ask my insurance provider to determine if the medical expenses of my bone marrow transplant will be covered? Whose insurance covers the medical expenses of the donor? How long does the insurance clearance process take? After bone marrow transplantation is approved as a treatment option for me, how long will I have to wait before I can receive the bone marrow transplant? What type of preparative regimen will I have before the bone marrow transplant? What are the side effects of the preparative regimen? What types of precautions must I follow before and after my bone marrow transplant? Will I have to have blood transfusions during the transplantation process? What are the risks and potential complications of bone marrow transplantation? What is Graft-versus-Host disease (GVHD) and can it be prevented? What are the signs of GVHD, rejection, and infection? How and when will I know if the bone marrow transplant was successful? What types of resources are available to me during my hospital stay and during my recovery at home? WHat types of medications will I have to take after my bone marrow transplant? How long will I have to take them? After I go home, how long will it take me to recover? What type of follow-up care is recommended? How often will I need to go to follow-up appointments? Can I receive follow-up care from my primary physician, or do I need to go back to the center where I had my bone marrow transplant? If I live far away from my transplant center, do I have to stay near the transplant center during my recovery after I'm discharged? If yes, for how long? Will I receive help in making accommodations? 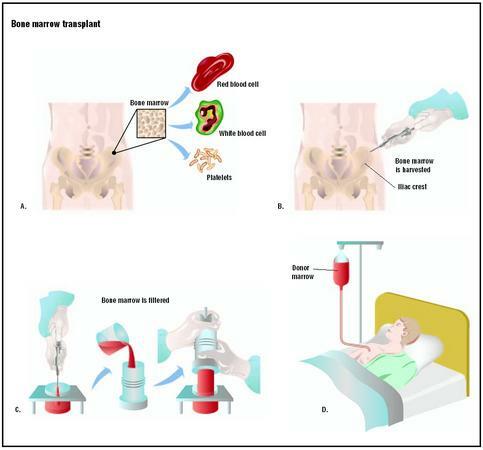 I am a student studying at the University of Kwa Zulu Natal Pietermaritzburg and am doing a power point talk on cancer Please could I use the image of bone marrow transplants found at the following web address http://www.surgeryencyclopedia.com/A-Ce/Bone-Marrow-Transplantation.html to illustrate the talk. If permission is granted please tell me how you would like the copyright to be acknowledged. This was a well written and informative artcle that was written in a way that everyday readers can understand without a medical background. I really appreciate your accurate details and research. I was a bone marrow donor in 1998 for my brother. You may want to amend one thing about the donors that you may not know. Only donors who do not know the patient get the medical expenses completely paid for. Sibling donors will incur costs including time spent away from work, medical deductibles for any care they receive as a patient after the procedure, as well as travel and hotel accomodations. Just thought I would let you know. Thank you. now he his suffering from severe lower back pain. Diagnosis: Marginal Zone Lymphoa (Maltoma with extranodal involvement) with relapse. My Father Aged 53 in sep 2007 with intestinal osbtruction and CT documented mesentric LAP and solid mass-cloni with liver hypodense lesions. He went surgincal resection of terminal ileum and promial colon with HPE-low grad lymphoma-maltoma. He received 6 cycle of Mebthera (CVP+Rituximab) After regular follow up in 2008 CT showed colon thickening mesentric LN. Liver lesions were diagnosed as hmangiomas. In Aug 2010 presented to hospital with abdominal pain and weight loss, which the CT showed 15.5X9.5cm LN mass with enlarged spleen and thickened wall of intestine. Biopsy revealed NHL/DLBCL with CD20 weak positive CD79a+ev, Ki67 (15%). At the same time with HGsAg positive with HBeAg+Ve and HBV DNA. He received 4 cycle of ICE the CT showed a decrease but there Dr. indications went for Transplant. In May 11 He was presented to another best hospital and he was examined throughly, he had genralized LAP bilateral cervical / axillary / groin, testes were normal. Initial statement of Dr was that he will receive 2 cycles to shrink the tumors and then will under go Autologus steam cells transplant. Later on after 2nd cycle PET CT was advise and another 2 cycles were recomended. Now another PET CT was done right after 4th Cycle and Dr. suggested for another 2 cycles of chemotherapy and then Transplant. What will be the survival rate in this stage. Writing a speech on bone marrow and the benefits of donation. I'm going to be an nurse and need to take this class to get into this program. I greatly appreciate your article for my cited sources. My husband is 72 years old and has just been diagnosed with AML. We are awaiting the cytogenetic (? )results from his bone marrow biopsy. Other than this, he is healthy, still employed and his echo cardiogram revealed a healthy heart. Should the results come back and support a 7 + 3 treatment, we will consider that; we have also been given information about injections that would be available as a treatment. Like most, we want him to live well as long as possible. I realize you cannot tell us what to do...we are at Vidant Medical Center, transplants are not done here...we have children in Boston and in Baltimore, so we could leave here and go to one of the medical centers in those areas. Would you stay here or go? What should be consider in making this decision. Im a sickle cell patient and I hardly have crisis(maybe few times in 4 years), my blood genotype is SC. Is it advisable for me to have a BMT? My 43 year old husband had follicular lymphoma, had the bone marrow transplant last September. He was an autologous donor. He walked into hospital, in remission and was told he was an excellent candidate. Unfortunately he never survived. He passed away 7 weeks ago, and now I have many questions. How can a fairly healthy person, in the prime of his life, go in for a transplant with the hope of having a prolonged life, as per doctor's discussions, and not walk out of hospital 7 months later. I'm confused and heartbroken that the love of my life is dead at the young age of 43. Chemo doesn't start. .doctor told again 1 month treatment for pneumonia. .. when everything will ok ..then only chemo will given.after that bone marrow transplant is also compulsory. .I am confused how much time will take for whole process. ?..how much chance for success? & if success he will be normal &work properly or not. ..many questions in my mind...n pain..very hard to face it because he is main person of family. ..We depends on him. ..don't know how much expenses also. ..O God bless us..